 In pleading for universities to give religious teachings the same respect they give feminist and multicultural perspectives, Marsden (History/Notre Dame, The Secularization of the Academy, etc.) cogently argues that major American universities, founded essentially as religious institutions, are now so hostile to religion that they largely exclude religious viewpoints. Marsden reminds the reader that in the 19th century, while ``the United States was formally pluralistic, its cultural centers had never seen a time when Protestantism was not dominant.'' Indeed, most late 19th-century colleges and universities actively promoted evangelical Christianity. Strikingly, by 1920, evangelical Protestantism had largely disappeared from the leading universities, as establishment Protestants used values of secular humanism and buzzwords like ``tolerance'' and ``liberalism'' to marginalize both fundamentalist Protestantism and Catholicism. This ``disestablishmentarism'' of religious perspectives, together with the ``universalism'' of the mainstream Protestantism that identified itself with secular culture and forced other religious positions to the periphery, ironically contributed to the establishment of nonbelief as the only valid viewpoint. The same arguments and attitudes used by liberal Protestants to exclude other religious perspectives were used to exclude normative religious teaching of any kind. Marsden argues that while the disestablishment of a universal religious culture is probably a positive development, the prevailing secularism actually constrains the free exercise of religion. The academy should make room for traditional religious viewpoints, he says, just as it has done for other perspectives that go against the grain of mainstream scholarship. 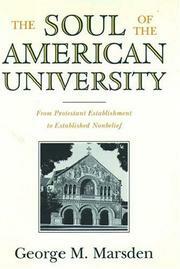 First-rate historical analysis, joined with a compelling argument for giving God a voice on campus, although Marsden, limiting his discussion to ``great universities,'' does gloss over relevant areas: influential Jewish or Catholic institutions, most Southern and African-American colleges, and conservative Protestant colleges.